Give a fun, personally-sized and creative thank you gift! 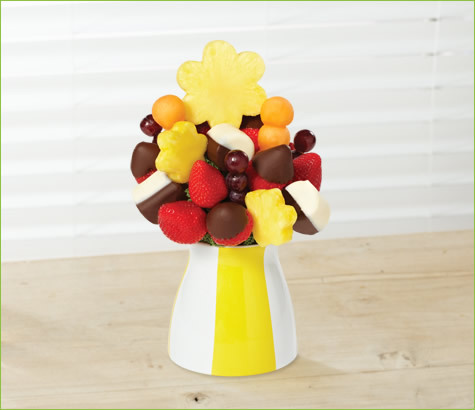 At Edible Arrangements® we know the right way to say thanks and what could be a better gift for this sentiment than our brand new Thank You Bouquet? This arrangement features daisy-shaped pineapples, hand-dipped semisweet chocolate covered strawberries, yummy grapes and our signature white and semisweet chocolate dipped bananas. We’re pretty sure when you give this gift they will be thanking YOU instead! Container may vary.